Actor/comedian Vince Vaughn has been publicly libertarian for years now. This does not seem to have kept him from landing high-profile roles. We'll see if this remains the case now that the actor has bravely and unequivocally defended the right to bear arms. I actually don't recall having seen him in any movies myself, so I won't comment on how his chart reflects the types of roles he plays. We're just here to see "why", in astrological terms, he's a libertarian. Libertarian: Pallas parallel Mercury, novile Sun, and ruled by Uranus which is opposite Sun. The Pluto connection is not weak, but the Mercury/Sun connections are quite a bit stronger. Collectivist: Neptune in the Second House, quindecile Mars, ruler of Venus. The psychology here leans pretty far Left in terms of the perception of value. This is very common if not ubiquitous for creative types. Vaughn is not a libertarian because he has a "capitalist psychology" a la Ayn Rand -- he's a libertarian because his logical/ethical faculties are strong enough to overcome his psychological tendencies. This is inconclusive, suggesting that we don't really have a culture-warrior here. 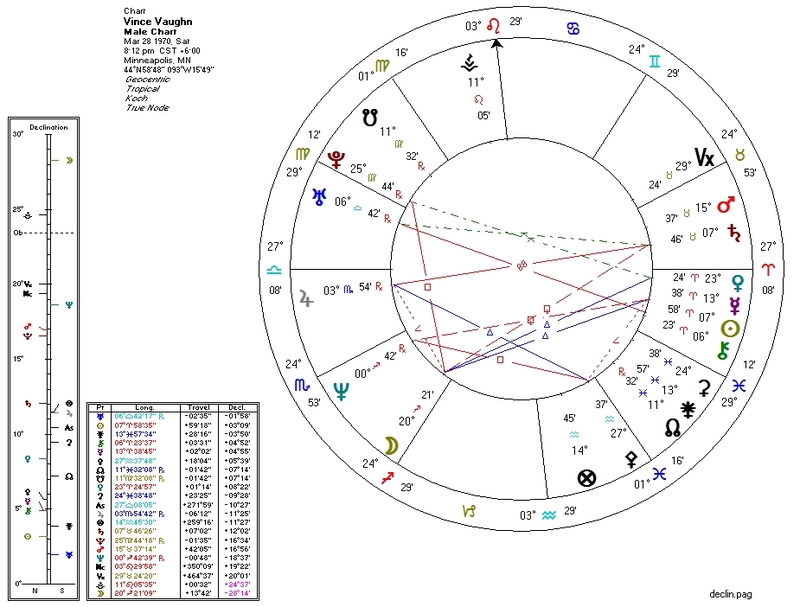 However, Pluto is square the Moon and quincunx Venus which hints at a potential "feminist" tendency which might be tempered by the strong Pallas. Were Pallas a bit weaker, Vaughn would probably be a very run-of-the-mill Hollywood liberal. I'm looking forward to seeing Vaughn in "True Detective", as I don't usually go see the comedies he seems to regularly do.